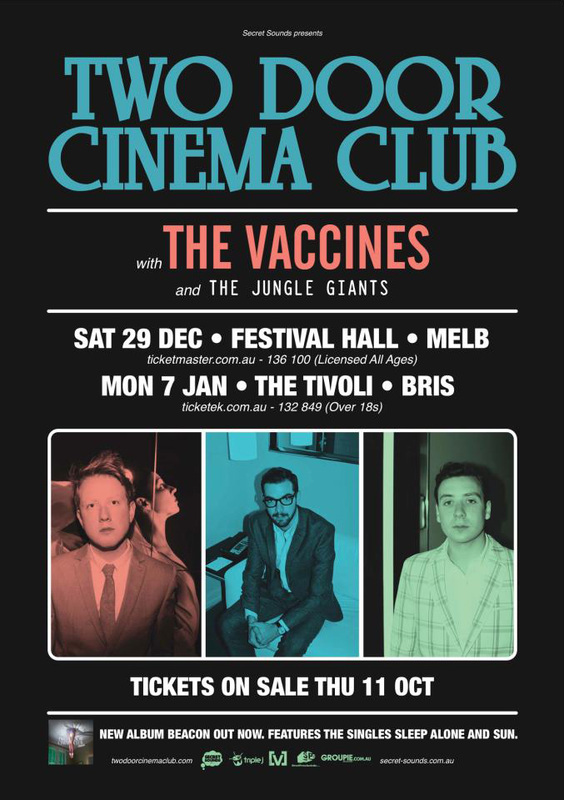 Two Door Cinema Club and The Vaccines have a announced two very special sideshows in Melbourne and Brisbane while the lads are back in Oz for Falls & Southbound Festivals. Joining them on both sideshow dates will be special guests The jungle Giants. Hailing from Ireland, three-piece Two Door Cinema Club returned only weeks ago with follow-up album, “Beacon”. The relentless touring after the success of platinum selling debut “Tourist History”, meant the recording of their second effort, strongly reflects on their time on the road. Bursting at the seams with their signature electro-tinged indie-pop, “Beacon” has been met with praise from Australian listeners, including garnering triple j feature album status. Only 18 months after releasing their debut “What Did You Expect From The Vaccines”, Justin Young and his band-mates returned earlier this year with “The Vaccines Coming Of Age”. The second instalment from The Vaccines sees a welcome progression from the band by media and fans alike with rapt reviews and sold out shows around the globe. Rounding out the bill is Brisbane indie outfit The Jungle Giants. After releasing their second EP “She’s A Riot” and a single of the same name earlier this year, the four-piece have been on the road sharing their energetic wares with fans around the country. Tickets for these not to be missed shows go on sale at 9am on Thursday October 11th.